Our conservative candidates really need our help - the grassroots can truly make a difference where we live, work & play. John can really use your help to win - it will be a win for us, too! 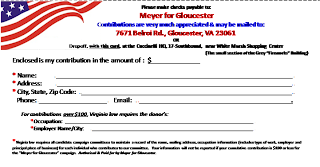 I am reaching out to you because you have expressed support for John Meyer to be the next Gloucester County Supervisor At-Large! You may have already received this invitation, but we are now asking your help to please forward this email broadly to your list of contacts and invite them to get together for one last fundraiser before the election. We're having a Fundraiser on Sunday, October 20 from 3:00-5:00pm at the home of Dave and Sarah King. Attached is a flier with all the information. Tickets are a donation of $20/person ($30/couple), and are available at the door. Please RSVP by Friday, October 18 (5pm). If you are not able to attend, a donation card is attached below, and also attached to the flier. 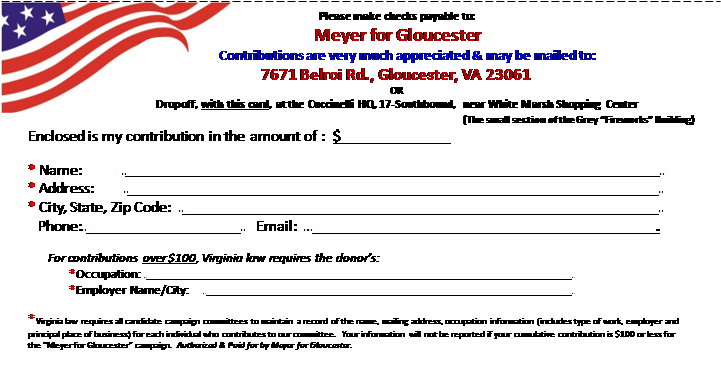 Your generous support will be very much appreciated and will help get John over the finish line on November 5!! !